Chachis Story - We care and you do matter! Chachis WE CARE and you do MATTER!! I thought long and hard about posting about our ordeal with Chachis. Part of me thought this was too much for the general public to handle, but then again, this is reality and I feel very strongly that no matter how bad it is every one needs to be aware of what is happening to our innocent animals. Nothing will ever improve if we hide our head in the sand. There are terrible people out there doing terrible things to these precious helpless animals and we must all be aware and do something about it. When we started this blog it was to give you a glimpse into the life of rescue, as you can see there is good and there is bad, all of it part of life. This is a story about the bad. 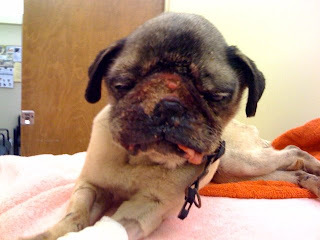 We got a call at 9 p.m. at night on 3/18/08 from an animal control officer at an LA shelter, asking us to take Chachis, a 13 yr. old female Pug. They said she was in terrible shape. The owner had turned her into the shelter that night. We worked for hours trying to work out the logistics of getting Chachis into our care. We are used to seeing bad, but nothing prepared us for Chachis, her condition was critical and beyond deplorable. We are hoping and urging the shelter to file chargers to the person that did this to her. One of our volunteers drove down early on the morning of 3/19 to pick up Chachis. He was truly startled and shaken when he saw her. We transported her to our Vet who was ready to give her immediate medical care. Even our Vets were extremely upset by her condition. I went to the Vets to meet her, evaluate her and talk to the Vets. Though I was warned, I too was shocked to the core. Chachis was loaded with maggots coming out of every crevice and crawling all over her. She was skin and bones and had a huge mass in her mouth that didn’t allow it to close it. Anemic, her temperature was so low that she was immediately put in an incubator. One eye was ruptured; organs were starting to shut down, skin lesions from being on cement for a long time. A terrible sight, something you don’t expect a true human being to allow to do to an animal. After many tears and the heartbreaking decision to let her go was made. We knew no matter how much we did for her it wouldn’t be enough, she was too far gone and we didn’t want her to suffer one more minute. Chachis went peacefully with much love around her and lots of tears, surrounded by people that truly CARED for her. Our volunteers are all badly shaken by this, we see a lot, but this hit our souls so deep it will take a while to let it go. We won’t get over it, we shouldn’t as we must always remember Chachis and continue to care for others like her. For the short time we had her, we loved and honored her, we wished we had more time to get to know her, and show her how much we cared -- that she did MATTER to some one. Please if possible give a donation in honor of Chachis so we may continue to care for the many animals that are neglected and abuse. Let Chachis know her suffering will help others. Let her know she mattered!